2009 Wisconsin Act 100, relating to impaired driving, takes effect July 1, 2010. Among several important changes, the law creates new misdemeanor classifications, establishes probation eligibility for all criminal OWI offenders, permits all counties to adopt programs that offer reduced jail sentences on completion of treatment and supervision, expands orders and penalties regarding ignition interlock devices, and affects occupational license eligibility. 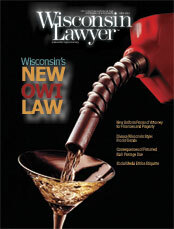 The legislature responded by passing 2009 Wisconsin Act 100, which takes effect July 1, 2010.4 The media labeled the law as taking a firm stance against drunk driving by enforcing harsher penalties.5 However, a deeper analysis reveals that the new law encourages jurisdictions to consider and determine if a well-monitored treatment program, combined with a period of supervision and a reduced jail sentence, will be a more effective means to deter recidivism. This article explains several of the important changes made by the Act and their implications for Wisconsin lawyers and judges. Winnebago Sentencing Option Expansion. The new law expands to all counties the sentencing option formerly only authorized in Winnebago County. The program allows courts to offer all misdemeanor offenders the opportunity to participate in a period of supervision that includes intensive alcohol or drug treatment in which OWI offenders are closely monitored by substance abuse counselors. Successful completion of the program results in reduced jail sentences.9 The legislature’s decision to expand this option affirms that this program is an effective way to avoid recidivism. It will be interesting to see whether counties throughout the state choose to adopt these reduced-sentencing options. Those that do must ensure the curriculum includes both a treatment plan and a period of supervision. Expansion of Ignition Interlock Device Orders and Criminalization of Violation of Interlock Orders. The new law requires individuals to equip their vehicles with ignition interlock devices (IIDs) in a variety of situations. IIDs require the subject to submit a breath sample before and during the operation of the vehicle. The device prevents the engine from starting or continuing if the subject’s breath-alcohol concentration is more than the device’s programmed blood-alcohol concentration (BAC) allowance. Under the new law, the IID restriction period does not commence until an offender obtains an operator’s license from the Wisconsin Department of Transportation (DOT). 22 The old law allowed the restriction period to commence at the time the judge ordered IID. As a result, certain repeat OWI offenders and persons convicted of implied consent violations will endure IID restriction periods that extend beyond their driving privilege revocations. Although it is not emphasized, the new law grants the courts a great deal of discretion in determining the appropriate time at which they should require persons to install IIDs in their vehicles.26 In fact, nothing in the statutory language requires the installation of an IID immediately upon the issuance of the order for an IID. It is more reasonable for courts to order IIDs at conviction but require installation at a later date, when an offender becomes eligible for an occupational license. This avoids the problem of having unused IIDs in vehicles that will not be driven for a minimum of 45 days. Defense attorneys should take note of the new statutory provisions regarding IIDs, because enforcement of the difficult deadlines will require substantial planning and preparation before defendants are sentenced. Many defense lawyers see little or no benefit for a defendant to plead guilty to a first-offense OWI, because a guilty verdict at trial does not result in a substantially harsher penalty than if the case had been resolved with a plea agreement. Thus, the impediment to first-offense OWI litigation is largely the financial burden on the defendant. The new IID law changes that financial calculation. IID devices are costly to the users, especially if installation is required for multiple vehicles. It remains to be seen whether this increase in the cost of a first-offense OWI conviction will result in substantially more trials, thus further weighing down an already overburdened court system. Under the new law, the parties may still stipulate to a lower BAC in cases in which the BAC was 0.15 or higher, subject to the limitations of Wis. Stat. section 967.055.30 In cases in which the test result is a 0.15 or higher, but there is other evidence to show that the driver had a BAC under 0.15 at the time of driving, prosecutors may be willing to stipulate to lower BAC levels. Defendants may then be more inclined to negotiate resolutions to their cases to avoid having to equip their vehicles with IIDs. On the other hand, in the absence of such a stipulation, many first-offense cases that normally would have resulted in plea agreements may now require litigation regarding whether the BAC exceeded the 0.15 threshold. Thus, to adequately defend their clients, attorneys representing first-time OWI offenders with a BAC of 0.15 or higher must become familiar with the science of breath and blood tests, including the level of uncertainty in such tests, and all potential forensic defenses. The new law also extends the application of IID orders to first offenders who refuse to submit to an evidentiary breath or blood test.31 In cases in which the defendant refused to submit to the evidentiary test and was charged with a refusal pursuant to Wis. Stat. section 343.305(10), most Wisconsin jurisdictions encourage a dismissal of the refusal charge in exchange for a guilty plea to the OWI charge. Hence, in cases in which the defendant may be subjected to an IID order because of an alleged refusal violation, there now will be greater incentive for the defendant to enter into a negotiated disposition that avoids the IID requirement. The new law inadvertently creates an anomaly in Wisconsin’s implied-consent law, which was enacted to encourage persons arrested for OWI to submit to evidentiary tests of their breath or blood. If the dismissal of the refusal charge in a first OWI-related offense will relieve defendants of the IID penalty, savvy persons who believe they are driving with a BAC of 0.15 or higher will be more inclined to refuse the test. New PAC Level of 0.02 for Offenders Subject to IID Orders. The new law extends the prohibited alcohol concentration (PAC) level of 0.02 to any person who is subject to an IID order for the entire duration of that order.32 Under the old law, the PAC level of 0.02 applied only to persons with three or more OWI convictions.33 As a result, individuals driving under IID orders may receive an additional PAC charge if they are arrested and have a PAC equal to or greater than 0.02, regardless of the offense number. Although they might not be charged with OWI if they are at the 0.02 level, a PAC charge of this type will subject an offender to the same potential penalties that an additional OWI or 0.08 PAC charge carries: an alcohol-related offense conviction with additional jail time and fines. Andrew Mishlove, U.W. 1981, practices statewide. He is a board-certified OWI defense specialist, whose practice is limited to OWI defense. Lauren Stuckert, Marquette 2009, is an associate of the Law Offices of Andrew Mishlove. During law school, she clerked and worked for attorney Daniel L. Shneidman. The authors thank Attorney Barry Cohen for his valuable suggestions. The new law abolishes that expunction exception, even for those cases in which the offense occurred before July 1, 2010.36 Thus, persons who anticipated an expunction of their records for cases within the last 10 years will not receive that important relief. This will be unsettling news for offenders who entered into baby PAC agreements within the last 10 years, believing that these convictions would be automatically cleared from their records after 10 years. The legislature and the DOT may revisit this issue in light of the potential for litigation regarding the ex post facto objections. The new law prohibits most baby PAC negotiations. While it is still permissible to dismiss the OWI charge in return for a plea to the PAC charge, it is no longer permissible to amend the alleged alcohol level to allow the defendant the benefit of a baby PAC negotiation.37It is important to note that under the new law, the charges of OWI and PAC carry the same penalties, regardless of the offense number or BAC level. However, although a person can be convicted of both OWI and PAC, the violations are joined for purposes of sentencing; thus, a person can only be penalized for one or the other. The new law provides more dramatic relief for individuals who have committed two or more OWI-related offenses within a five-year period. The old law required these “federal repeaters” to wait a full year before they were eligible for an occupational license.40 The new law permits even federal repeaters to obtain occupational licenses after a 45-day waiting period. It bears repeating that all offenders must complete the required statutory assessment and must prove they are in compliance with the ordered driver-safety plan and IID requirements to obtain an occupational permit.41 The abolition of the federal-repeater waiting period applies to offenses committed on or after July 1, 2010. Under section 343.02(1), the DOT may consider extending this reduced waiting period to offenses that occurred before July 1, 2010 but for which sentencing occurred after July 1, 2010. Penalty Adjustments for Third and Subsequent Offenses – Longer Sentences and Immediate Incarceration. The new law makes several adjustments to third and subsequent OWI offenses. It increases the mandatory minimum jail sentence for a third-offense OWI from 30 days to 45 days.42 Under the old law, courts had the discretion to allow all criminal offenders up to 60 days to report to serve a sentence.43 Under the new law, third and subsequent offenders may not be released on bail once a judgment of conviction is entered. Courts still have the authority to stay entry of a judgment of conviction after a plea, effectively delaying the sentence.44 An additional exception is provided for situations in which the court finds good cause to delay the start of the sentence, such as a pending appeal or a probationary disposition.45 A court still may allow an offender up to 60 days to report to jail for a second-offense violation. Nevertheless, attorneys for third and subsequent offenders must be prepared to deal with the issue of immediate jail reporting upon conviction. Legislative Error: Extended License-revocation Periods. Section 343.30 is the statutory provision that discusses revoking licenses upon OWI conviction. The authors believe that subsection (1r) of that section is a legislative drafting error. The statute provides that “for any revocation the court orders under sub. (1q), the court shall extend the revocation period by the number of days to which the court sentences the person to imprisonment in a jail or prison for an offense related to the refusal.”51 This provision appears to mean that only those criminal OWI offenders who also were convicted of a Wisconsin implied-consent-law refusal violation will be subjected to these revocation extensions. It appears that the basis for creating section 343.30(1r) was section 343.305(10g), which was created to extend refusal revocations by the length of a person’s jail or prison sentence. However, because jail sentences are not permitted in refusal cases, subsection (10g) is anomalous. Therefore, since these revocation extensions only affect refusal jail sentences (which do not exist), no revocations should be increased by the length of a person’s sentence. If, as the Legislative Reference Bureau notes suggest, the legislative intent was to have the revocation period increased by the number of days spent in jail related to all OWI offenses, then the statutory language needs to be fixed. Federal Criticism regarding Wisconsin’s Repeat-intoxicated-driver Laws. An official from the National Highway Traffic Safety Administration (NHTSA), the federal entity that is involved in state impaired-driving law enforcement, has communicated to the Wisconsin DOT that its preliminary review suggests the new laws may not comply with federal mandatory-license-suspension requirements.53 Federal law requires that states must require either a minimum one-year license suspension for all repeat intoxicated drivers or a license suspension of 45 days followed by a reinstatement of restricted driving privileges for the remainder of the suspension period.54 The NHTSA official concluded that, in his opinion, a Wisconsin occupational license allows more expansive privileges than are permitted under the federal statute. These alleged expansive privileges include operating a vehicle when it is an essential part of the driver’s occupation or trade, traveling to and from church, and traveling to locations necessary to comply with a driver safety plan. A DOT official advised the authors that the DOT believes some assumptions in the opinion are incorrect and that the DOT can administer the new law in a manner that complies with federal law. The DOT hopes that the issue can be resolved before July, when the new legislation becomes effective. The NHTSA might, however, insist that Wisconsin make occupational licenses more restrictive for repeat offenders or be subject to a penalty of transfer of federal highway funds. Such a penalty would result in a transfer to Wisconsin’s highway-safety program of federal dollars intended to be used for construction projects throughout the state.55 Until this issue is resolved, counsel should advise defendants who have two or more OWIs in any five-year period that there is uncertainty about what types of operation will be allowed on any occupational license they obtain, and that the licenses may limit operation more rigidly than they have in the past. Wisconsin suffers from an extraordinarily high rate of drunken driving.56 This has long been a matter of public concern and activism. Wisconsin counties with a high volume of drunk driving cases now are able to encourage treatment through the court systems. At the same time, penalties associated with OWI convictions have been increased several times in recent years to deter people from driving while impaired. Even in a first-offense case, the consequences of an OWI conviction may have a drastic effect on the life of an offender, particularly one who drives for a living. OWI law and science also have become far more complicated. With more than 30,000 OWI cases per year in our state, lawyers need to be aware of all consequences of the recent changes and their effects on OWI litigation. 1Tom Kertscher, Physician Held in Fatal Crash, Milw. J. Sentinel (April 28, 2008) <http://www.jsonline.com/news/waukesha/29594494.html>. 2The Wisconsin Statutes contain several laws pertaining to driving under the influence of alcohol and other substances. Most often, defendants are charged with operating a motor vehicle while under the influence of an intoxicant (OWI) and operating a motor vehicle with a prohibited alcohol concentration (PAC). Except when indicated, this article uses the term “OWI” to generically refer to any alcohol- or drug-related driving offense. 3David Kesmodel, Wisconsin Sours on Lenient Drunken-Driving Laws, Wall St. J. (June 18, 2009). <http://online.wsj.com/article/SB124537195041529851.html>. 4Unless otherwise noted, all statutory references are to the new law, which applies to offenses committed on or after July 1, 2010. 10Gina Barton & Steven Walters, There’s Little Will to Change the Law: Criminalizing First-offense Drunken Driving Would Face Steep Political, Cultural Hurdles. Milw. J. Sentinel (Oct. 25, 2008). <http://www.jsonline.com/news/wisconsin/33316794.html>. 14The numerical references to alcohol level refer to grams of ethanol per 210 liters of breath or grams of alcohol per 1000 milliliters of blood. 16Wis. Stat. § 343.301 (title). 17Wis. Stats. §§ 343.301(5), (3)(a). 24Wis. Stat. § 343.30(1q)(b)3., 4. 30Wis. Stat. § 967.055(2)(a) (detailing limits of prosecutorial plea negotiations). (references the penalties that have been extended to .08-.099 PAC convictions). 39Wis. Stats. § 343.30(1q)(b)3., 4. 45See Judicial Council Note 1981 to Wis. Stat. 47Wis. Stat. §§ 346.65(2)(am)6., 973.01(2)(d)4. 48Wis. Stat. §§ 346.65(2)(am)7., 973.01(2)(d)4. 51Wis. Stat. § 343.30(1r) (emphasis added). 52Senate Substitute Amendment 2, to 2009 Senate Bill 66, Analysis by Legislative Reference Bureau, Note 7, ¶2. Under this substitute amendment, the period of revocation begins on the date on which the person commits the OWI-related offense, but the period of revocation is extended by the number of days that the person is required to spend in jail or prison. 53Memorandum, from NHTSA Office of Legislation and General Law re Review of Wisconsin’s Repeat Intoxicated Driver Law Under the Section 164 Criteria. March 12, 2010. 56See the DOT Web page discussing statistics related to drunk driving in the state. <http://www.dot.wisconsin.gov/safety/motorist/drunkdriving/>.